These Roasted Sweet Potatoes with Cinnamon and Sage are super delicious and a great complement to your Christmas meal. The roasting enhances the natural sweetness of the sweet potatoes. Crunchy on the outside, soft on the inside, they are a healthy alternative to traditional (white) potato dishes. 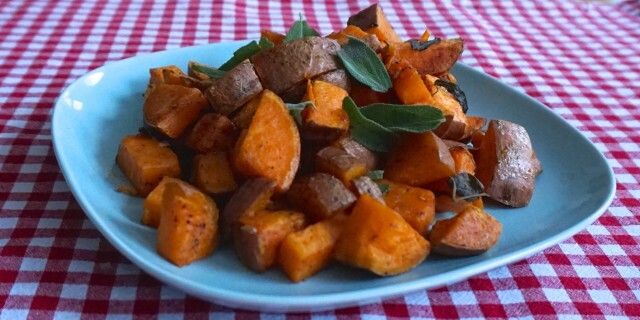 Sweet potatoes are a staple in my kitchen, especially during the winter season. They are my idea of comfort food. They have such a beautiful natural sweet flavour when roasted and they are rich in nutrients too. Sweet potatoes are also a healthy way to indulge your sweet tooth. Lay the sweet potato wedges out in a single layer on a lightly greased non-stick baking tray. Drizzle with olive oil and mix with the broken sage leaves, crushed chili, garlic and cinnamon. Season with freshly ground black pepper and sea salt. Remove the oven and transfer them to a serving platter. Garnish with fresh sage leaves and sprinkle extra virgin olive oil and lemon juice on top.